Mexico is a megadiverse North American country with a wide range of climates (e.g., wet tropical, warm temperate, mediterranean, and arid) and a diverse topography (from sea level up to 5700 m asl). These characteristics together with its location in the transition toward Central America make this land a global biodiversity hotspot with species belonging to northern (Neartic) lineages co-occurring with others from southern (Neotropical) lineages. An important factor contributing to this biodiversity are the frequent disturbances in this region where volcanoes, hurricanes, and wildfires are common, together with droughts and floods. 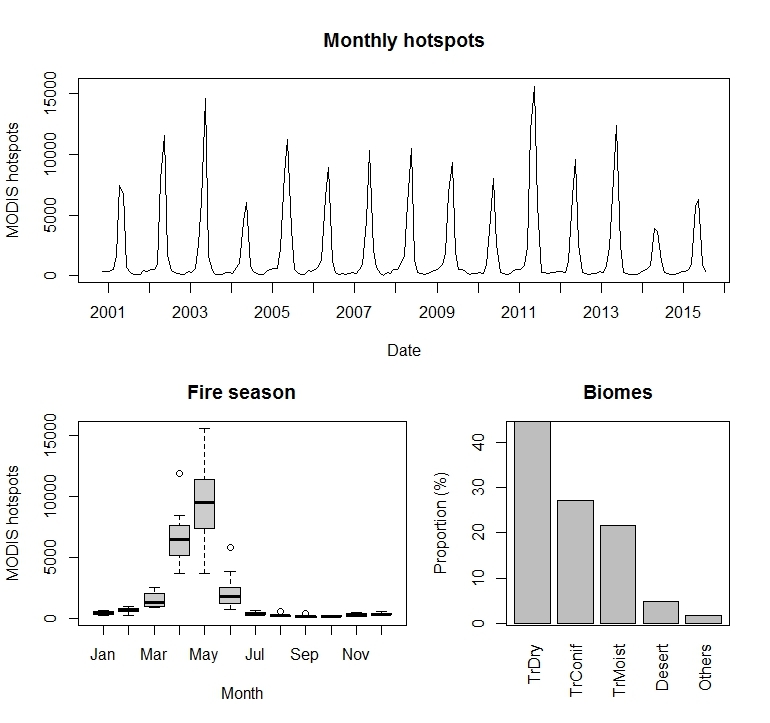 Fires occur mainly in April-May (Figure below, ); the natural sources of ignition being lightning, especially in mountains, and volcanoes (with clear evidence of fires ignited by volcanoes, e.g. from the Popocatépetl volcano). However, currently most fires are caused by human activities, as in many other countries. Hurricanes add fuel and increase the intensity and probability of fire . Mexico is a center of diversification of pines (Pinus) and oaks (Quercus), two species groups strongly related to fire [3,4]. Mexico harbors about 50 species of pines and these incorporate all the fire strategies and traits observed in this genus . For instance, there are many fire tolerant pines with thick barks, self-pruning abilities, and in some cases, with basal or juvenile resprouting capabilities; fire embracers (postfire seeders) with thin bark and serotinous cones; and fire avoiders that lack these traits. The country also harbors some 160 Quercus species, ranging from strongly resprouting shrubby species to many tree oaks with relatively thick bark that live in surface fire ecosystems, and including evergreen and drought-deciduous species with a large range of leaf morphologies. I was surprised to see some oaks with very large, and very thick leathery leaves that are deciduous, certainly an outlier in the leaf economics spectrum. More details in .